The main interaction shoppers have with your organization often comes at the point-of-sale. You need fast and accurate transactions to keep your lanes flowing smoothly and keep your customers returning time after time. Zebra array imagers also improve productivity – giving you the ability to capture the data that matters most. 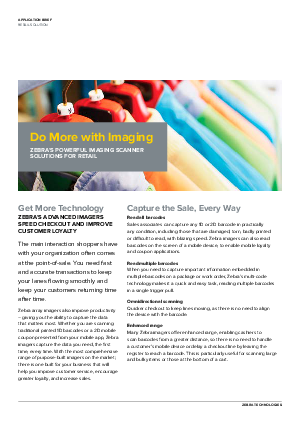 Whether you are scanning traditional printed 1D barcodes or a 2D mobile coupon presented from your mobile app, Zebra imagers capture the data you need, the first time, every time. With the most comprehensive range of purpose-built imagers on the market; there is one built for your business that will help you improve customer service, encourage greater loyalty, and increase sales.